Low Lint is more than a marketing technique; it is a standard in this department. Measures are taken daily to ensure each glove is exactly the way it needs to be for the customers and end users. In areas of manufacturing that require environmental control from contaminants, such as paint departments in the automotive world, the gloves used need to be secure and dependable so that every final product is detailed exactly the same. From the knitting, to sorting and inspecting, and to the final stage of packing, our low lint gloves are selected to perform at their best. 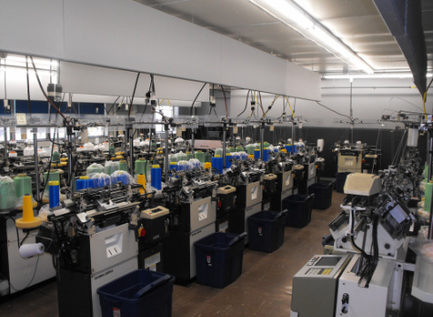 We incorporate Polyester, NegaStat®, Twaron® filament and other yarns to create a line of products for cleanliness, anti static, and even light cut resistance. The TSG-153 series is a 13 gauge, 100% virgin Twaron® filament, silicone-free glove. It has a 2” cuff with an overcast edge. The distinctive yellow with green identification provides visual compliance. The TSG-153 series cuff is overcast using a thermal heat-set yarn to minimize any errant particulate created by traditional surging. Cuffs are color coded by size for easy identification and visual compliance. This series is able to be laundered, providing cost saving opportunities. The TSG-153 targets work areas requiring low lint with cut and abrasion protection while also providing dexterity. It works well for handling stamped edges in the paint process. Available in sizes extra small, small, medium, large, and extra large. The TSG-414 series is a 10 gauge, natural Twaron® filament glove plaited with 100% polyester. It has a 2” cuff with an overcast edge. The TSG-414 is designed for clean rooms and departments traditionally wearing one glove for cut and abrasion protection under a second glove for low lint. By combining cut and abrasion protection with low lint properties, this glove improves employee comfort and compliance with an all-in-one design. This series is able to be laundered, providing cost saving opportunities. The TSG-414 overcast cuff reduces particulate compared to the traditional sewn over-edge glove. The distinctive blue color of the yarn provides visual compliance. The TSG-414 series targets work areas wearing two gloves such as clean rooms, paint, and plastics departments that require a low lint glove but also need cut and abrasion protection. Nega-Stat® for anti-static properties. It is silicone-free. It has a 6” cuff with an overcast edge. Solid black provides a sharp contrast to industry automotive products giving better product identification during application and quality control. The TSG-206 series cuff is overcast using a thermal heat-set yarn to minimize any errant particulate used by traditional surging. Cuffs are color coded by size for easy identification and visual compliance. The TSG-206 targets work areas requiring low lint and clean areas such as paint and engine departments. The TSG-60 series is a 13 gauge, domestic polyester, silicone-free glove in heather green. It has a 2” cuff with an overcast edge. TSG-60 series cuff is overcast using a thermal heat-set yarn to minimize any errant particulate used by traditional surging. The TSG-60 targets work areas requiring low lint and clean areas such as paint and engine departments. The TSG-201-2 series is a 13 gauge, domestic blue polyester glove. It is silicone-free. It has a 2” cuff with an overcast edge. The blue polyester provides a sharp contrast to industry automotive products giving better product identification during application and quality control. TSG-201-2 series cuff is overcast using a thermal heat-set yarn to minimize any errant particulate used by traditional surging. This series is able to be laundered, providing cost saving opportunities. The TSG-201-2 targets work areas requiring low lint and clean areas such as paint and engine departments. The TSG-277 series is a 13 gauge, silicone-free, domestic polyester glove in black. It has a 2” cuff with an overcast edge. Solid black provides a sharp contrast to industry automotive products giving better product identification during application and quality control. TSG-277 series cuff is overcast using a thermal heat-set yarn to minimize any errant particulate used by traditional surging. ​The TSG-277 targets work areas requiring low lint and clean areas such as paint and engine departments. silicone-free, seamless string knit glove of medium weight. It is made with domestic polyester. It has a 2” cuff with an overcast edge. The consistent white color provides a sharp contrast to industry automotive products and debris, giving better product identification during application and quality control. The TSG-397 series cuff is overcast using a thermal heat-set yarn to minimize any errant particulate used by traditional surging. This series is able to be laundered, providing cost saving opportunities. ​It is also available in black domestic polyester, the TSG-397-B. Available in sizes extra small, small, medium, large, extra large, and 2XL.